We want to hear from you! The International Association of Business Communicators (IABC) is the premier global network for professionals engaged in strategic organizational communication. Founded in 1970, IABC is comprised of over 16,000 business communication professionals in more than 70 countries and over 100 chapters around the world. 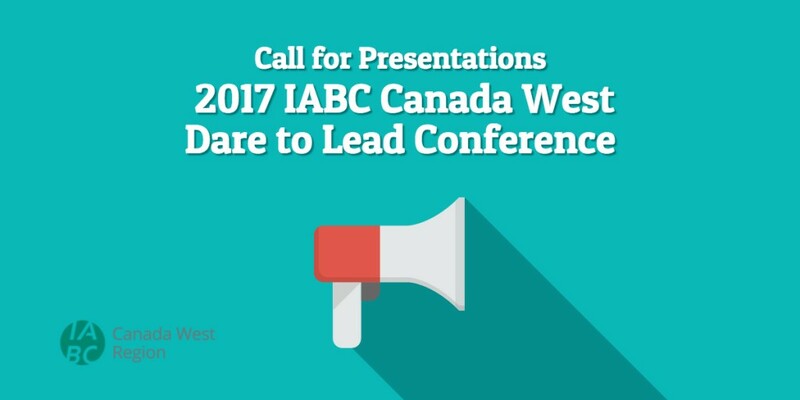 Each year, IABC Canada West Region hosts the Dare to Lead Conference (D2L), which is attended by Board Members from six chapters in the four western provinces. This two-day conference provides a chance for chapter leaders to come together to focus on professional development, strategic planning, board governance and to learn about innovative practices and trends in the industry. Each year, 60 to 80 conference attendees participate in a series of events including keynote speeches, professional development presentations and interactive workshops. To submit your proposal, please click here to fill out the Presentation Proposal form. Proposals will be reviewed by the Conference Committee for topical relevance and the collective diversity of the presentations overall. Notifications of acceptance will be sent out in March. Please note: We have a small honorarium available for keynote presentations. However, as a non-profit association, most of our speakers volunteer their time to present. We are seeking presentations that will inspire and reflect innovative ideas, programs, services and practices. You are encouraged to share your research, tools and tips, and/or personal stories. Feedback from previous Conference attendees has been an overwhelming desire for practical tools and takeaways that they can incorporate into their Board and professional work. Innovative strategies in marketing, communications, social media etc. Presenting at Dare to Lead provides the opportunity to share your experience and expertise, showcase the latest research, exchange ideas and help contribute to community building and advancing partnerships within the field. The event brings together influencers and decision makers focused on a broad range of professional services and products including strategic communications planning, public relations, advertising, graphic design, audio visual, events planning, website development, social media, and many others. IABC members work with and for some of Western Canada’s largest public and private corporations, successful small businesses and non-profit organizations in the industrial, healthcare, financial services, government, education, consumer products, technology sectors and many more. If you have any questions, please contact communications@iabc.bc.ca.